I had to stop by school last month to drop off a book and found tons of maple seeds scattered all over the front of campus. I can remember throwing the seeds up in the air or throwing them down from a 2nd story balcony. Since we live in a condo with a 2nd story walkway I decided to bring some home so my boys could have fun with them. 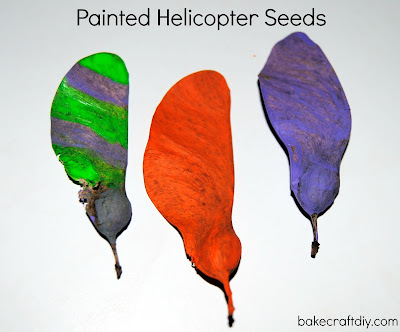 My boys loved them but they were hard to find so we decided to turn it into an art project and we painted our maple seed helicopters so we could easily spot them when they landed on the ground. And it has been a lot more fun to see the colored maple seeds fly down my oldest (3) would probably play with them all day if he could throwing them down, going downstairs to pick them back up and coming back up just to repeat the process... over and over. So watch out for maple trees and if you find one be sure to pocket a handful of the seeds to take home for your kids to paint and play with.